Alden Ehrenreich, as Han Solo, wonderfully portrays his hero’s journey from a poor, oppressed dreamer to heroic pilot. His mannerisms and line delivery excellently match up to the standard set by Harrison Ford. Joonas Suotamo, as Chewbacca, encompasses an extraordinary counterpart Peter Mayhew’s mantle as he perfectly portrays his growing friendship with Han. Donald Glover, as Lando Calrissian, is my favorite character due to his exact interpretations of Billy Dee Williams’s zany parlance. His banter with Solo only forwards the character’s legacy. Woody Harrelson, as Beckett, provides for a flawed yet effective mentor to Solo by guiding him about motivations and how to deal. Emilia Clarke, as Qi’ra, is great with what she is given, but her character falls into the stereotypical “will they or won’t they” love interest loop. Paul Bettany, as Dryden Vos, is menacing with his passive aggressiveness building to volatile outburst when his orders are disobeyed. Ron Howard efficiently grasps all the characters’ tales by providing great interactions with known Star Wars lore. My favorite scene is the initial train heist as it showcases how unprepared Beckett’s gang was and is intense as regards the fates of all characters involved. Also, there are great displays of special effects with the train’s movement patterns. The one flaw is that it really doesn’t Solo any character transformation as he always remains heroic with the only change being how he goes from rags to riches. The love triangle between Solo, Qi’ra and Dryden also feels uninspired. The most interesting character is Becket, played by Woody Harrelson. He is a true team player, but what team does he play for? His chameleon-like persona is wonderful to see and a testament to this talented and beloved actor. 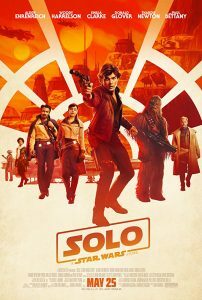 I give this film of 4 out of 5 stars for the performances, which are spectacular, especially Glover, Harrelson and Ehrenreich, along with special effects, creepy wardrobes, action scenes and Star Wars references that any true fan will ‘get’ (like the Kessel Run, the Millennium Falcon and of course, the necklace hanging on the rearview mirror). I recommend this film for ages 8 to 18. I caution younger viewing due to adult themes and fight scenes which may be disturbing to younger children. Photo by Jonathan Olley – © 2018 – Lucasfilm Ltd.